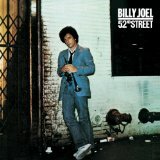 Billy Joel’s first #1 album, 52nd Street, was released on October 13, 1978 (to see my B.J. playlist and albums, click here). Following on the breakout success of 1977’s The Stranger, Joel’s rise to superstardom was complete with 52nd Street. The album sold over two million copies in the first month after its release and won the Grammy for Album of the Year in 1979. For those thrilled with Joel’s piano-based pop-rock, 52nd Street was and still is a triumphant album. Three Top 40 hits (#3 “My Life,” #14 “Big Shot” and #24 “Honesty”) drove radio airplay and sales, but the remaining tracks, including the jazzy “Zanzibar”, the staccato “Stiletto” and the ballad “Until The Night” are not filler by any stretch. In fact, those three are among the best of Joel’s recordings from the late 70s. 52nd Street is included at #352 on Rolling Stone magazine’s Top 500 albums of all time. It’s further distinguished by being the first rock album to be issued on CD when the new format entered commercial distribution in 1982. 52nd Street is available on Amazon (as a CD) and iTunes (as track downloads). This entry was posted on October 13, 2010, 5:20 pm and is filed under Uncategorized. You can follow any responses to this entry through RSS 2.0. You can leave a response, or trackback from your own site.